Congratulations to everyone's accomplishments. I was finally able to get past a tough(for me) section of my learn to play the Blues book. Modular 12 bar blues. It is not very smooth, but I can do it. It really helped me to read this thread today, I was beginning to do that [being to tough on myself stuff]. Seeing how others are moving along in the journey helps more than I thought. Gute Nacht Freunde, es wird Zeit für mich zu gehn. 1.Für den Tag, für die Nacht unter eurem Dach habt Dank,für den Platz an eurem Tisch, für jedes Glas, das ich trank,für den Teller, den ihr mir zu den euren stellt,als sei selbstverständlicher nichts auf der Welt. dafür, daß ihr nie fragt, wann ich komm oder geh,für die stets offene Tür, in der ich jetzt steh. 3.Für die Freiheit, die als steter Gast bei euch wohnt,habt Dank, daß ihr nie fragt, was es bringt, ob es lohnt,vielleicht liegt es daran, daß man von draußen meint,daß in euren Fenstern das Licht wärmer scheint. You are quite right - we are often too tough on ourselves and we need to focus on what is going well rather than be discouraged about something that went wrong. Johan -great way to end the day! I don't speak Dutch, but I think the idea of the song (good night Friend?) seems to be one of thankfulness...now I'm curious and will have to look it up. ! Buona notte, amici, è tempo di andare per me. e un ultimo bicchiere in piedi. 1.Per il giorno, hanno per la notte sotto il vostro tetto voi, per il posto al tavolo, per ogni bicchiere bevuto io, per il piatto, che lei mi chiede di te, come se nulla al mondo naturale. garantire che non si chiede quando vengo o andare, la porta sempre aperta, dove mi trovo ora. 3.Per la libertà che vivere come un ospite costante di voi hanno, grazie di non aver mai chiede cosa ci vuole, se vale la pena, forse, è perché pensiamo là fuori, che in più caldi le finestre, la luce splenderà. Dear Johan, how very kind of you! I do speak Italian (though English is my first language) and the song is lovely. Well, not really an achievement, so much as an alignment of the stars . #1 I'm a teacher, and the school year is winding down so I now have time to play again. 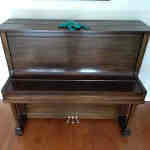 #2 My parents have offered their piano since they're moving to a condo--a 1925/26 Heintzman. I had it checked out on the weekend, and it turns out it's in very good shape, only needs a tuning! I was worried that it was going to be way past it's prime. #3 Then yesterday I got an e-mail out of the blue from my piano teacher (haven't talked to her since September), asking me if I would like piano lessons this summer. Cool! Oh, here's a picture of the piano (of course ) taken when it was being evaluated this weekend. I'll post pics when it arrives at my house! If you look closely, you may even see the chipped keys from my hot wheels, 30-odd years ago! Well Glen, that's just downright delightful! How lovely that a piano you grew up with is now coming to live with you! and just think....the week has barely begun, who knows what else might be in the stars for you? Glen, how exciting for you! My husband is a teacher, so I know how your time can just get sucked away during the school year. 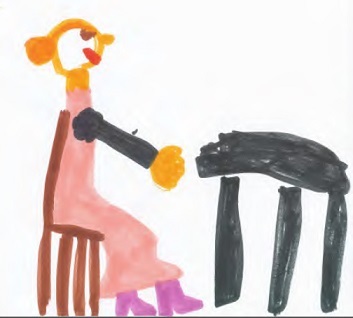 Enjoy that piano, the lessons, and your summer break! I am still on my streak of practicing every day. I will be completely away from a piano on Thursday and Friday so I am sad about that. The biggest accomplishment this week is DD's she's graduating from Wash. U with a double major in history and art history. Last edited by Shinichi Chiaki; 05/19/10 03:28 AM. Kim - congratulations to your daughter! Great combo! I did literature with almost enough courses for a double major in history, but not quite! And I did one lone course in art history. The fun thing is that I was particularly interested in the middle ages, and now I'm living in a place where they actually happened! I brought all my university books over when we decided to stay here indefinitely (it has now been just about 16 years! )....and I've had great fun visiting so many of the places I read about. Shinichi - I can't wait to be at the stage where I can figure out a bit of left hand work on my own! That's really fun, and a lovely development! This is a skill I want to have. My husband is in LOVE with an old Greek folk song (a Hadjidakis tune) and actually once said, "That would bring tears to my eyes if you could play that." I have my relatives in Greece looking for the sheet music, but until they find it (if they do), I have begun to play just the melody by ear. I am at a loss as to what to do with chords though. Your lessons sound really fun. Much more theory-filled than mine. You take two lessons a week though right? By the way, we have another thing in common--I was a software guy before becoming a teacher. Last edited by Glen R.; 05/19/10 09:18 AM. Thanks for the vote of confidence! I'm going to take the plunge! Maybe I'll call on you for coaching Teodor! Greg, I'm a teacher too - ESL - and in a way I hate my summers off - most people I know don't have the whole summer free, and those that do tend to head out of town, so I'm at home with no one to play with! .......... But this year I have my piano! I wondered if you were an ESL teacher. That is so interesting. Are your piano lessons in Italian? Or are you teaching yourself? My daughter would love to see more of that part of the world. The funny thing is that she calls the notes do re mi and I call them C D E...sometimes we get a bit confused, but we get along splendidly. She is a perfect match for me in terms of personality and style. I did it! lol..... Happy Birthday and Twinkle Twinkle and I'm a Little Tea Pot - with chords, no music. A baby step, but a most satisfying one! Last edited by casinitaly; 05/19/10 01:35 PM.